I love those Pillsbury ready to bake croissants, cinnamon rolls and pastry doughs that come in the blue tubes. I always find myself staring at them longingly for a couple of minutes every time I go grocery shopping. I never end up buying any because I know that I will probably finish them too quickly, worrying that they will “spoil”. However, this one time, I gave in and bought some pie crust. Harmless, right? Right. 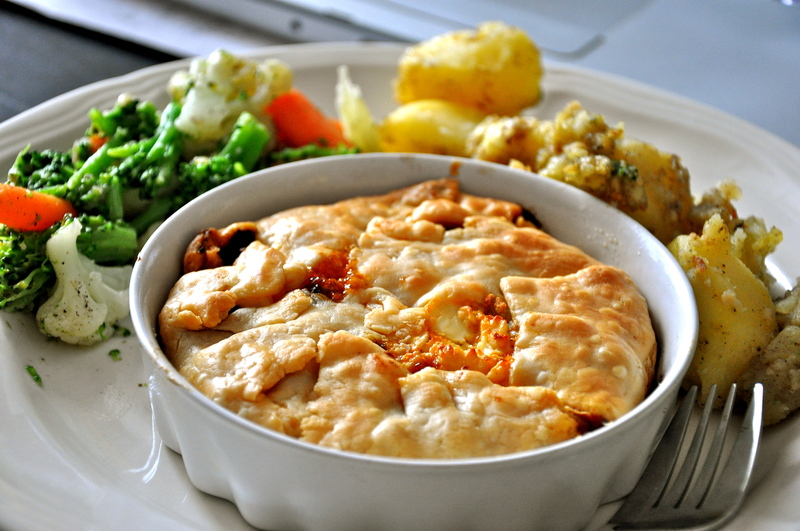 This is probably the most unhealthy item on my blog, but I like to think that the vegetables balance it out. The reason this is a “taco” flavoured pie, is because that is literally the only seasoning I had on me at the moment. I also had shawarma seasoning, but I’m not ready to find out what shawarma pie tastes like. Anyway, without further ado, here’s a bright picture and the recipe. Marinate your chicken in salt, pepper, lemon, ginger and garlic. Steam veggies and toss them in butter & garlic and some salt & pepper if you like. Boil the potatoes until they are soft and starting to crumble. Put a knob of butter in the pan, some garlic. some salt and pepper, cover it and toss it so the potatoes are coated evenly. Put the potatoes onto a baking dish and stick it in the oven, changing the settings to broil halfway through. Pull them out when they are crisp on the top. To make the filling, finely chop onion and fry it with the garlic on a hot pan. Add the chicken and add taco seasoning as you stir fry it. Once the chicken has browned, leave it aside to cool. I added mushrooms to the chicken towards the end just because I had to finish mine but you don’t need to. Grease your pie dish with some olive oil. Cut the crust out in a circle (I didn’t do this, I just tore off pieces and arranged them properly onto the pie dish. place your filling inside the crust and seal the top with some more crust or simply by pulling in the sides. Make a hole for the steam to escape and stick it in the oven at 350 until the crust is golden brown. Arrange on a plate and enjoy! 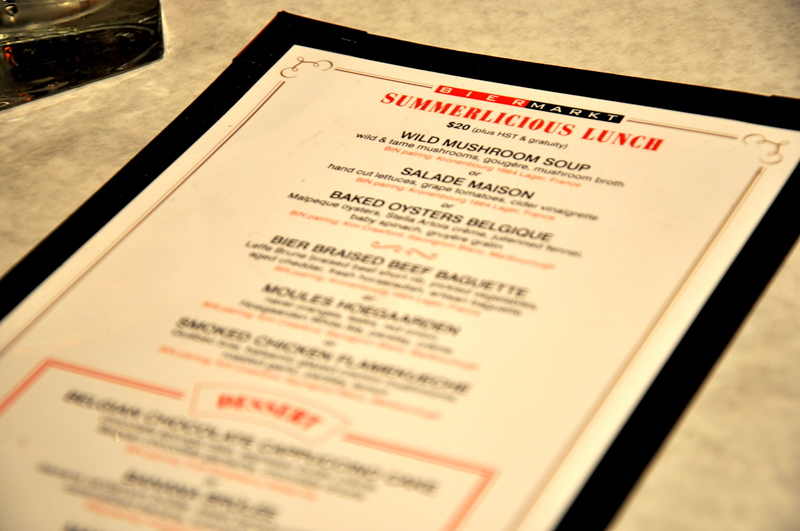 Summerlicious has been on my list of things to do for the summer. A couple of old friends suggested lunch at Bier Market, a place I had heard about but never visited. I didn’t really know what to expect. The restaurant itself has a very slight European feel with its patio tables and Belgian words on the menu. You can definitely tell it’s in Canada. The ambience is a little too dark for my taste, but very interesting use of space, colour and old bags of wheat and wood. The doors are out of the ordinary but nothing else really is. What is amazing is the number of different kinds of beer. They even have Kingfisher, an Indian beer I watch my dad drink when we visit relatives back home! I was introduced to what is now my favorite kind of beer: Früli. I had it in a cocktail but to be fair, the cocktail only had Früli, rum and lime so I think I can say it’s my favorite beer, haha. Other than that, Bier Market didn’t really impress me. Like most restaurants in Toronto, it is way overpriced for the quality of food served. 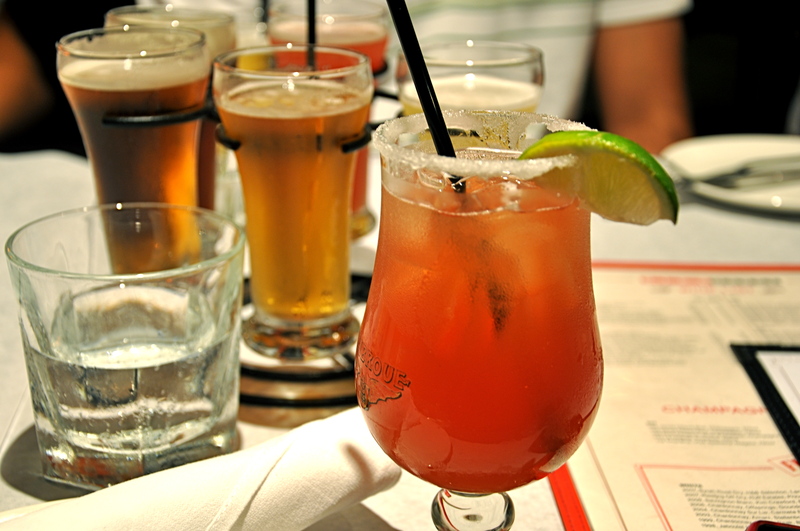 Check out more Summerlicious menus & restaurants here. Strawberry Dak with Früli, rum and lime. Behind the rosy glass is a beer “sampler”, that features any six combinations of beer you would like for $20. It’s quite a lot of beer for one person, but seems fun nonetheless. 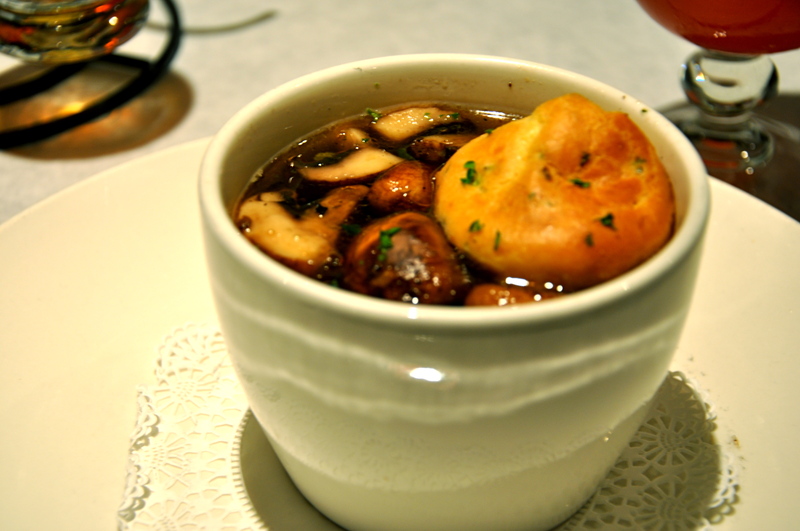 Wild Mushroom Soup: Everyone that ordered this expected a creamy mushroom puree sort of soup. However it was surprisingly delicious and flavourful. The little egg and chive souffle on top was an interesting little bonus. I saw some mushrooms I’ve never seen before, even in stores. Who knew mushroom broth could be so flavorful? 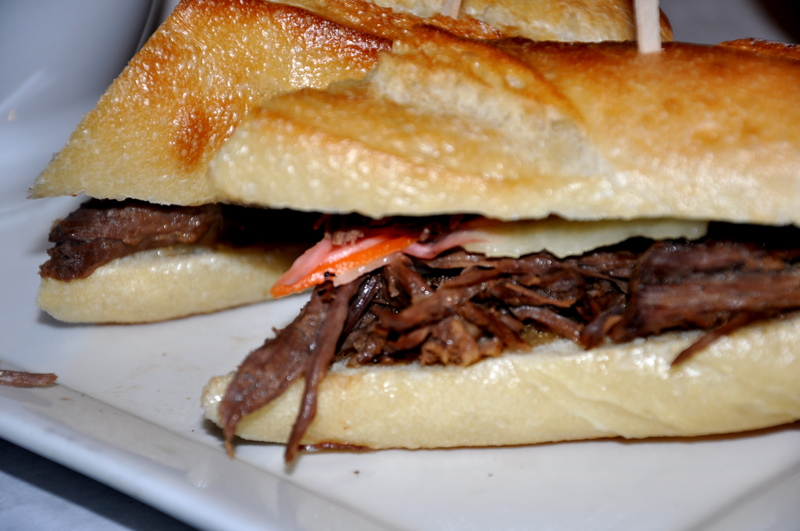 Braised Beef Baguette: I don’t eat beef but everyone who ordered this thought it was the blandest sandwich they had eaten. As described on the menu, it seemed like a juicy flavourful sandwich, which apparently it was not. However the balsamic vinaigrette it was served with did help to boost the flavor. 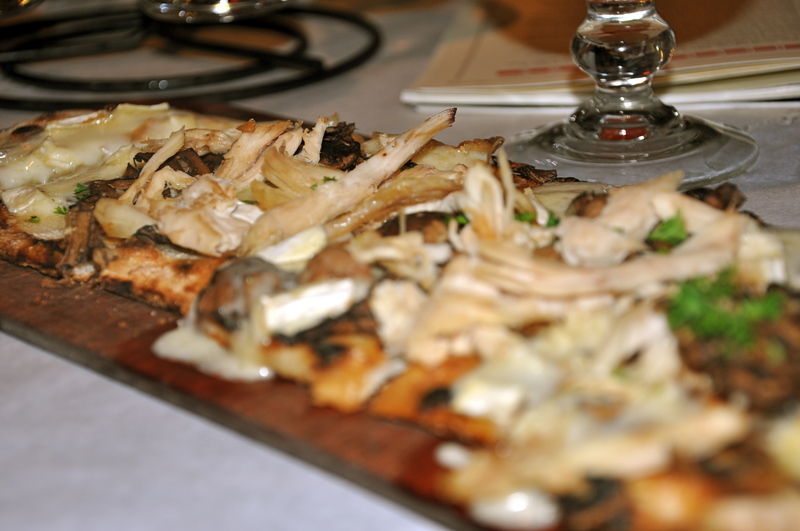 Smoked Chicken Flammekueche: A sort of crunchy, thin flatbread topped with smoked chicken, garlic and I believe it may have been Gruyère cheese and served with a wedge of lime. This may have been the best thing on the menu. Very flavourful, the cheese and chicken gave it a wonderful texture and it tasted sort of like a gourmet chicken salad sandwich. 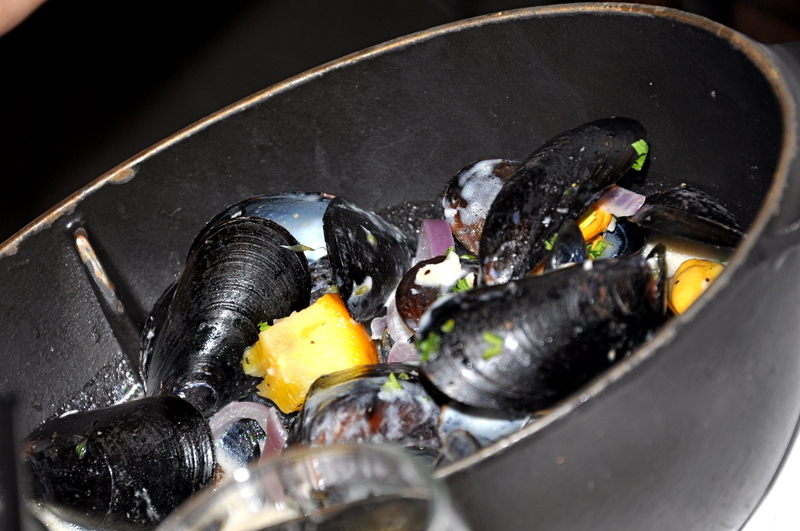 Moule Hoegaarden: Mussels in a white hoegaarden sauce. I didn’t eat this but all I heard was that it really wasn’t all that special or out of the world. Not impressive. I kind of inhaled the dessert before I could remember to take a picture of it, but I had an Austrian funnel cake topped with some sort of Mango-vanilla cream compote. It sounded a lot fancier than it was, it was simply Austrian funnel cakes, little pastries topped with a sort of fresh mango ice cream. It was delicious but not as exotic as I expected it to be. The verdict? There are cheaper places that have more flavorful food. But fewer beers. Perhaps Bier Market must be visited to drink and not eat. I live about 15 hours (by flight) away from my mom and one of the things she often worries about is the food I eat. One of the things she remembers well about my university is the fact that most eateries are fast food places and that there is no green grocer close by. This means that I can’t get fresh vegetables as often as she’d like me to and this worries her a lot. I was brought up eating good, fresh food straight from my mother’s little kitchen garden, so you can see why she worries about the lack of fresh food. Doesn’t get any fresher than a kitchen garden! It’s definitely difficult to eat well in university what with all the running around, the time consuming assignments and lack of convenient access to good home cooked food. Luckily enough, during my second year, my university residence began a program called the Good Food Box program. For $12 every two weeks you can order in a Good Food Box which contains a mix of fresh, local fruits and vegetables. 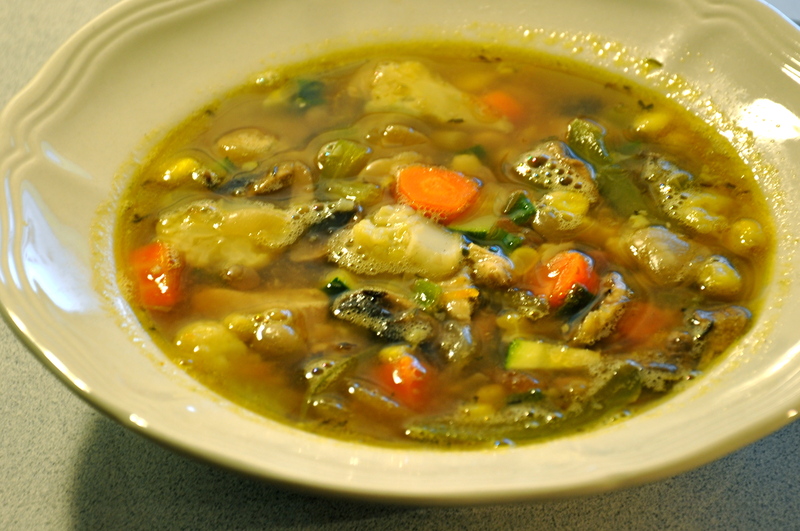 I first made this soup when my fridge was full of Good Food Box vegetables. I thought a soup would be the best way to incorporate a little bit of every vegetable and make a little space in my fridge. However, a little bit of every vegetable is a giant pot of soup that went back in the fridge and was eaten over a span of three days. That’s pretty much why I call it fridge soup. It’s a very convenient thing to have in the fridge because all you have to do is heat it up in the microwave for a couple of minutes and it’s a hearty, filling meal each time. Unlike some foods, the flavour does not deteriorate from just sitting around in the fridge. I believe it should last about a week in the refrigerator. Although this is still a no-no when it comes to my mother’s idea of fresh, it is a much healthier and purer alternative to what is offered on campus! You can make the soup with pretty much any vegetables you have in your fridge. I kind of wish I had butternut squash for this one, it’s one of my favorite things to put in a soup! Without further ado, here’s a picture & recipe! Sorry for the terrible colour/lighting, it looks like murky kitchen sink water in this picture. I often experiment for dinner (so it’s dark by then) and I only have yellow light in my room! I promise you though, it was wonderfully vibrant and delicious smelling. Nothing like kitchen sink water. You can use any vegetables you want, but to give you an idea, here’s an ingredient list. *Other vegetables you can use are: Butternut squash, radish, parsnip, potato, eggplant, okra, spinach, kale, cabbage. Prepare the chicken breast the way you like it. I like all my chicken marinated in garlic and ginger so it doesn’t smell so chickeny. I then fried it a little bit before I made the soup to get a little golden crust on it. Prepare your vegetables by cutting them all up into bite size chunks. Start your soup by frying half a sliced onion and a peeled (genius, quick way to do it: cut the skin with a knife and drop the tomato in a pot of boiling water for about 5-10 seconds and the skin comes right off), cubed tomato in some olive oil. Fry till the onion is translucent then add the chunky bits starting with the lentil-bean mixture and the vegetables that take longest to cook and ending with the vegetables that cook quickest, in this case mushrooms and peppers. Pop in your chicken, chicken stock, thyme, salt and pepper. Let the soup boil away until the vegetables and lentils are tender with a bite and not too mushy. When it begins to bubble throw in some chopped up spring onion and let it boil for a couple of more minutes. Take it off the stove, serve in a big bowl and enjooooy. At home, my mother often serves soup with some sort of crusty bread with a topping. On lazy days its baked beans and mozarella on crusty bread and on her I-love-to-cook days it’s her own creations that often consist of more healthy vegetables and meat. I’ve been in love with goat cheese since I ate it on a burger at The Football Factory at the Spain-Paraguay semi-final. I’ve been dreaming about it since. Today I was determined to be creative like my mom and eat my soup with crusty bread avec topping. So I kept the goat cheese in mind when I went grocery shopping. At the bakery, I found some beautiful Italian crusty bread and at the supermarket I found a small sized, affordable chevre. Perfect. Cut the Italian bread into slices so you have little round crostini that’s perfect for toppings. Fry chopped up mushrooms with sliced onions, minced ginger and salt and pepper to taste. Take it off the stove once the mushrooms are brown and let them sit. You let them sit because they release water and you wanna drain the water before you add the chevre. Once the water is released, drain it and add the chevre and mix. 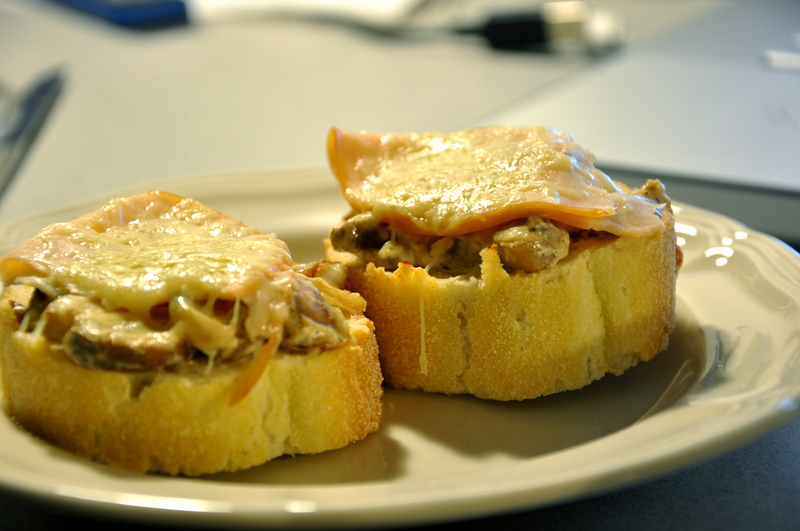 Top each slice of bread with the mixture , top with half a slice of chicken and grate some mozzarella over it. Stick it in the oven, on the top most rack for a couple of minutes and serve with the soup! I know the crostini recipe doesn’t count as dorm food but I currently am living in a dorm and I made it, so can you!